Whenever distance is calculated to or from Sun Quan, the distance is increased by one. Once per turn, Sun Quan can discard two same colored cards. He then takes a hand card from one other player. Sun Quan then takes the entire hand of all other players. Without seeing them he mixes them together. He then distributes them back so each player receives the same number of cards. Sun Quan keeps the remainder after everyone received as much as possible. "Jiang Dong" is forced and not an option. Sun Quan cannot reach anyone at first, but neither can anyone reach him. Even his friends cannot reach him at first. For "Family Heritage" both Sun Quan and the person initially targeted are immune to the later effects. No one gets to see the cards that go into the mix and they are given back randomly. 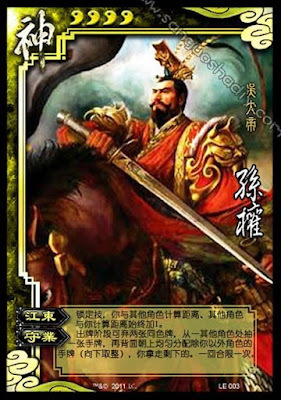 Sun Quan must give back as many as possible, but so that each player has an equal amount of cards after all is done. If there are any leftover that cannot be given back, these go into Sun Quan's hand.